When I try to recall my first memories of swimming, I think of joyful summer holidays by the beach and hours spent splashing around until my fingers were as wrinkly as prunes. It’s at school when it takes a more serious turn. The earliest memory that springs to mind is taking a water survival class which entailed wearing a whole outfit including heavy trainers and attempting to rescue each other – I remember it mostly because I hated it! After that, the teenager years kicked in and not being terribly gifted with naturally sleek hair and falling victim to the 80’s big fringe trend (I still haven’t forgiven my mum for this!) I remember it being such an awful ordeal to have a midday swimming class. Terrible hair, goggle marks and prancing around in front of boys on a cold winters day was never outweighed by a love to swim! I wouldn’t say I ever disliked swimming, it was just the effort, and the thought of it that always put me off practicing and learning how to get very good at it. As an adult, I am quite partial to a few breast strokes in the spa, nattering to a friend or choosing it almost as a ‘rest day’ activity but until last year I hadn’t really thought about taking it any further. I supposed it was inevitable that I would eventually want to take part in a triathlon. I love to run – marathons, half marathons, corporate 5k fun runs, I’m up for all of it. And I just love the way I feel after I’ve spent some time to myself pounding my stresses on the road behind me. I soon became intrigued by cycling, a bike ride to Brighton turned into a 100 miler around London and Surrey for the PruRide London, and then a cycle to Paris. I really enjoyed it but I still loved to run and wanted to keep up with both. The triathlon idea just evolved from there..
My previous blog posts mentions my first attempt at the sprint triathlon in London last year. I massively underestimated the most technical part of it – the swim. I was so unaware of how emotional and overwhelming it would be. I was completely terrified. 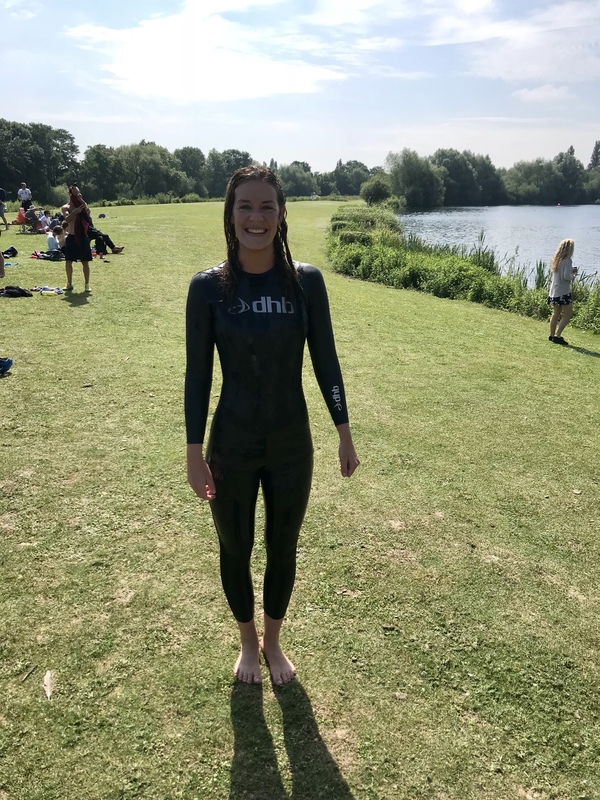 This year I wanted to challenge myself and overcome some of the fears I have with open water swimming. I’ve signed up to the Olympic distance triathlon which involves a 1.5km swim! It’s difficult to swim outdoors until the weather warms up, so mid May I took myself back to the lake! I could not believe how terrifying it was that first time and how different I feel now. I wanted to share the journey for everyone who has felt overwhelmed by swimming in the past, or for anything in life that feels impossible at the start. It’s 90 meters long which makes it the largest swimming pool in the area, and I love that it’s lined with cute Art Deco changing huts. There’s a great communal spirit here, and its such a welcoming place, not in the least bit intimidating. It is not heated however but incredibly refreshing. The Swim Fit gang on a Saturday morning are great – and I think it was here that something clicked and made me feel at ease in the water. This one is a 50 meter pool so shorter but still a great size for training. It has the benefit of being heated and a similar decor to Tooting. I love London Fields and Broadway market which makes a trip here also an awesome opportunity for a stroll around East London. There comes to a point where a swimming pool isn’t going to cut it. On triathlon day I knew I was going to be thrown into the Thames and it couldn’t be the first time I’d swam in murky, petrifying open water. (Yes – the Thames!!) I researched where to try and Shepperton is a super popular choice for South Londoners. They have a fantastic set up. Newbies are given a a briefing and heir swimming is supervised before they can venture too far into the lake. It’s scary! That I cannot deny but at least this option tries to ease some of those fears. Look out for my next blog post which talks about overcoming fear. It’s another East London choice – the iconic Olympic swimming pool. There’s something about being here that creates a buzz. And again it’s 50 meters so a great chance to fit in the distance without having to do a thousand lengths (how it feels for me at the tiny gym pool!). It’s also good to point out that these options are all very affordable, offer changing and shower facilities. There is decent parking at Tooting and Shepperton and the cutest cafes at Tooting and London Fields. 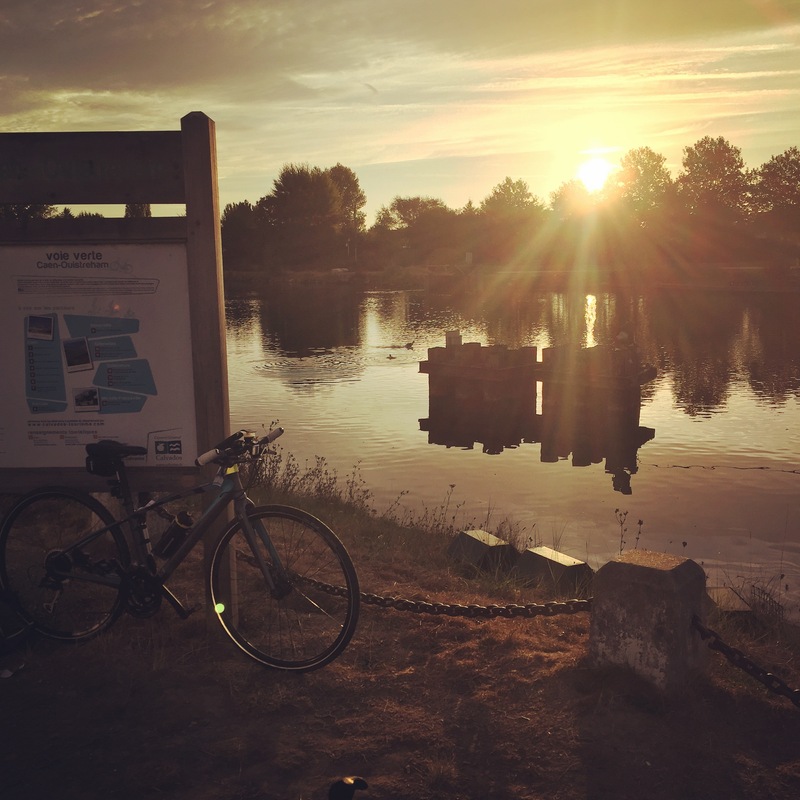 I hope you feel a little more inspired to give it a try..
Look out for more posts on my attempts to overcome the fear of the open water.. And how I get on at Windsor triathlon! A triathlon is such a great way to get fit. It is also so easy to train on holiday. I love swimming in the ocean, running across the mountains and exploring a city by bike. I’m so proud and happy to have completed my first tri taking part in the sprint challenge in London. Here are some tips if you’re thinking of signing up..
As runner and a cyclist the swim was always going to be my toughest challenge. It differs to the other disciplines because to me it felt like a real test of mental strength, me against the elements, the beast of the open water. And technique is absolutely crucial for efficiency! I realise now that I should’ve got to the lake more for training as there really is no other way to get to grips with the murky waters, the claustrophobic rubbery wetsuit, the crowded free for all and the lack of any ledges to catch your breath. The run feels kind of strange..
It’s something every expert warns you about but it’s really easy to underestimate how different your run is compared to a normal training run. The cycle can lead you into a false sense of security. You’ve got your rhythm and just the run left to tackle. After dropping off your bike you notice a feeling of slow motion, it’s takes a while for your legs to respond, like running through treacle, slow and sluggish. I noticed that my muscles eventually got back into the swing of things and I could’ve tested the waters a little earlier! I intend to try a spin class next week and run home afterwards to get used to the sensation and to know my limits. And one last tip for us ladies..